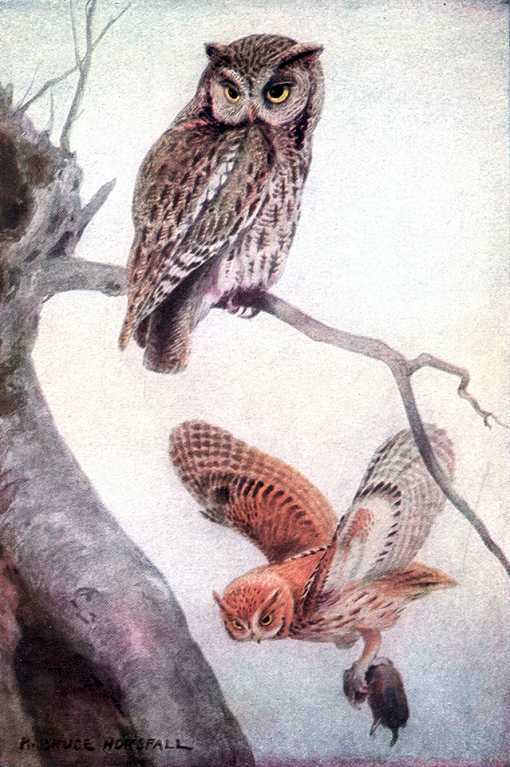 A little larger than the Eastern Screech Owl, about eleven inches long and having basically the same color variations: rusty red with light and dark brown or black streaks, or gray with black steaks and a fine yellowish tint and variations in between. White undersides with crossed black streaks. Conspicuous ear tufts and black circles around yellow eyes. Some of the older literature includes western North America as a residency of Otus asio, the eastern screech owl. 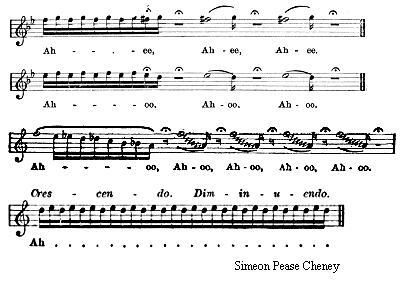 The two birds must have been considered alike enough in habits and plumage to be grouped as one. The Birds of America, 1917, index attributes the above illustration, by Louis Agassiz Fuertes, to both birds. The differences between the two birds in the painting are not meant to illustrate differences between western and eastern species. 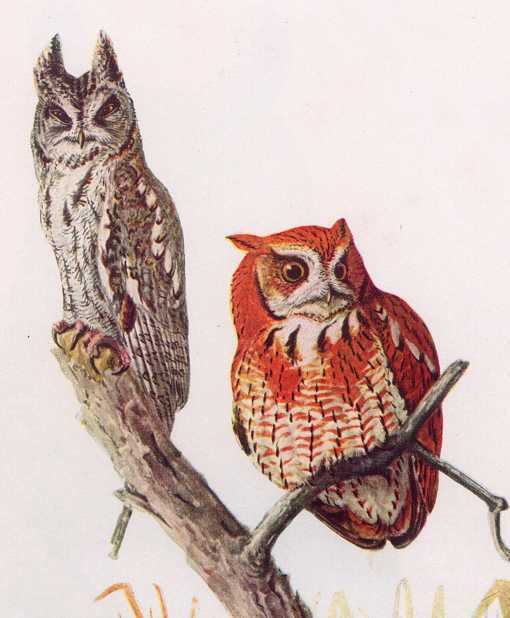 Rather they illustrate the red and grey “phases”, which appear within both western and eastern screech owls species. Western screech owls inhabit Northwest forests, groves, farms and wooded towns, often near water, from southeast Alaska, western Canada and the U.S. west of the Great Plains to Mexico. Since ancient times the owl or those who encounter it have been regarded as unlucky, a superstition perpetuated in particular by the screech owls proximity to people, its nocturnal nature and its eerie shivering, descending wail. They have been made into pets, although it is best for all observed in its own. Left to its choice the Screech Owl is a good neighbor controlling the local mice population. An owl’s fluffy feather edges reduce the noise of flight. Many neighbors are unaware of the Screech Owl’s presence until the bird swoops like a shadow toward an intruder, hooting and snapping its bill as it pulls up in the last second. They usually keep out of site during the day, but if they venture out, they stir up a commotion among song birds. Western screech owls build scanty nests of sticks, feathers and chips in natural or abandoned tree cavities, on rocky ledges, in farm sheds and bird boxes from waist level up to twenty five feet high. Females lay up to four white eggs which hatch after about four weeks incubation and young leave the nest in about another month. The Western Screech Owl Nest Box (same as for Eastern Screech Owl, Kestrel and Barrow’s Goldeneye) has an 8″ by 8″ floor, 15″ inside floor to ceiling, 3″ diameter entrance hole located 12″ above the floor and ventilation openings in the floor and under the ceiling. Assemble with corrosion resistant screws fit to pre-drilled countersunk pilot holes to reduce wood splitting. Place a bed of wood chips, not sawdust, on the floor. Mount out of reach (10 feet or higher) near woodland edges or clearings, small tree stands or under the eave of a farm out building within moderate distance of wetlands. Face south so they can sun themselves through the hole in winter. Woodpeckers, other owls and squirrels may use this box. The screech owl is more closely associated with human’s activities than other owls due to the abundance of prey, numerous nesting and roosting sites, and reduced competition in urban areas. Mount out of reach (10 feet or higher) near woodland edges or clearings, small tree stands or under the eave of a farm out building within moderate distance of wetlands. Face south so they can sun themselves through the hole in winter.